This was my husband's place - a space into which I seldom ventured, and was never invited. He built the whole sizeable structure almost entirely from reclaimed materials. Then he filled it with matchboxes full of meticulously sorted nails and screws, nuts and bolts. He loved those nutty chocolates that come in clear plastic boxes, because he could use the boxes for storing washers and curtain fittings. He had biscuit tins containing old locks and keys. He had a desk, two filing cabinets, an office chair, a radio, an electric kettle. He also had - far more than I had ever realised - a substantial range of expensive power tools. Nothing was thrown away. Old plastic tubing, once used in a long-vanished aquarium, was kept there in case it might come in handy again one day. Old towels, which I had relegated to the recycling bag, were rescued, folded and stored in the pigeon holes because, again, they just might come in handy. The shed is a place that defies logic to the female mind. Who needs a biscuit tin full of old locks which no longer work? Who needs twenty seven different lengths of string stored in a box labelled, 'String - Assorted Lengths', and a tottering pile of 'New Scientist' magazines dating back twenty years? I think only a man could answer this sort of question. My husband defended his territory, suspecting, quite wrongly, that I might attempt to have a clear-out. He even had a lock on the door and hid the key. If I needed a hammer I was told, 'Leave it to me, I'll see to it.' It was implied that women could not use hammers, could probably not even tell a hammer from a bradawl. It was clearly stated that the contents of the shed were sacrosanct, that I would not be able to understand their significance. That is perfectly true, and I believe most men would agree with him. I would never have attempted to clear-out the shed. My husband died two years ago, and I have still not done it. Sometimes I go in there and look, in a bemused sort of way, and remember. Sometimes I go and get a hammer, and use it efficiently. Widows can do things that wives can't. I can use a bradawl, too, and some of the power-tools, but I have not taken possession of anything, and I feel uneasy, somehow, making free with things that are not mine. We have a summer-house, and a garden tool store, both part of the same building, and both built by my husband from reclaimed materials. I would not dream of calling either of them a shed. The summerhouse and the garden store are bisexual. But sheds are for men. Actually, I see that kind of organization as more of a female trait usually. And lots of women are hoarders, too - so that's just an eccentric human thing. It's the flavor, tools and hardware - that is typically male. As a sewing room would be stereotypically female. Still, I can understand why you would not feel right disturbing it. My D has a box of cables and guitar odds that have been moved with us each time, and he is at a loss to explain why, except that they might come in handy. Zhoen: it's the 'shed' concept that interests me, and I wonder if it is something of a British speciality? A shed must be separate from the house, a private space for private hoarding, and preferably with a lock. Chairs and other domestic artefacts are usually salvaged, or rescued from the attic. How cultural is this, I wonder? R.R., so men have Sheds in England, too? They're recognised here as part of the culture. My elderly next-door neighbour had turned his extra-long garage into a super-shed, with a ceiling-mounted lathe and home-made machinery (such as a jigsaw). He used treacle tins as lightshades for these machines. If ever I needed anything doing, he had the wherewithal in the right size, and the skills, of course, to do it. He even transformed my Mothercare pram seat for the toddler into a seat for the back of my bicycle when the youngest became a big pre-schooler. I regret I never photographed this shed, and especially never got around to photographing my neighbour at work in it, before he died just a few days before his ninetieth birthday. As for hoarding: Well, I'm the one who hordes the just-might-come-in-handy-sometime things in this house. I even struggle to throw out margarine tubs, although when our city's new, improved, recycling system begins in a couple of months I'll be able to dispose of them happily. I have assorted lengths of string, miscellaneous nails and screws, old nuts and bolts, and a used lavatory cistern fitting, as well as lots of things I've forgotten about. But alas, unlike your husband's, mine are not sorted and stored neatly. I think hoarding potentially useful things is quite a Kiwi trait. Maybe it's a hangover from our comparatively recent colonial past. You never know when you might need something! Peregrina has touched on the two main things I'd have said. First, sheds are very much part of the New Zealand culture. They're also important elements of Australian culture (no jokes about oxymorons, please), and, I suspect, of many other (post-colonial?) cultures. Australia and the US both have books on the phenomenon: the Australian version is Mark Thomson's "Blokes and Sheds", the US version is James Twitchell and Ken Ross's "Where Men Hide". Second, the most accomplished hoarder I've ever known was a woman. No matter what length of string one needed, she'd have it stashed somewhere. Unfortunately, the desired item was often stashed beneath or behind a mountain of other useful items like mattresses, furniture, mobility scooters, plastic bags, and probably shoes, ships, sealing wax, cabbages, and perhaps even a stray king or two. Hoarding is wonderfully common to all of us - I love the treacle-tin lampshades, and the ceiling-mounted lathe, Peregrina, and the spare mobility scooters, Pete - (I collect the thick rubber bands that the postmen drop in the street), but Shed Culture seems exclusively masculine. The title, 'Where Men Hide' seems to sum it up. I am surprised at the strength of the taboo about entering my husband's shed, let along moving anything, and that this feeling continues two years after his death. A sad note, Peregrina: our town recycling system won't take margarine tubs, so you may still have to use them for storing paper-clips. Good news about the margarine tubs, R.R. I used to save them for a kindy as material for "works of art" until parents started sending more materials in. But our new recycling system, due to start in a couple of months, is taking all types of firm plastic, not just the two grades they do now. My paper clips won't go homeless. I've got a fancy little container for them. And round this house, the shed's MINE - well, it's the garage, really, but I promise I'm not possessive about it (except when it comes to having things moved or - horrors! - thrown out when I'm not looking). And whoops! I can spell "hoards". I must have been thinking of the hordes who hoard. My father has the same kind of set up, everything labeled and ready to go, if needed. My husband has a similar set up in our garage, although he has very little interest in fixing things, much to my dismay. I wish I were as organized. I can see why you did not want to disturb this precious space. I wouldn't either. Greetings, and thank you, Kat. The organisation of that space makes the taboo about touching it very strong. If it was messy I would be able to get in there and clear it. So I shall keep my own stuff in a mess to make life easier for my sons - eventually! I often call my studio, my shed. However, my husband wandered in while I was working in there and marvelled. My shed is more organised than his! When my Grandad died, his shed was left unopened for a long time. I will always remember the smell of his shed, wood and turps and roll your own cigs. He was a carpenter by trade, so eventually his tools ( beautiful wood planes and chisels) were given to members of our family. My husband is proud to now own some of them in their new home in Australia. ps to see Possums - see my previous post to the one you commented on! Having seen the original, I really appreciate this post and I imagine it conveys the essence of your husband and his personality as much as any photograph or letter. A topic for a thesis, methinks. Oh, thank you, HHnB - how did I miss them? You are the first woman I've met who owns a shed, but I note that you also call it a studio. mm - and you're the second! But an inherited shed may not count as being truly 'yours' and when you've cleared it out you may find it's a Japanese tea house. Or something? The gender of outdoor buildings offers much scope for thought. I like to have a good look at allotment sheds and spot the ones with curtains! This is such a lovely post. 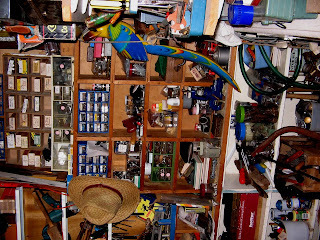 My father-in-law has a garage full of stuff, with no order to it whatsoever, I think its the chaos he loves. I hope you don't mind I have tagged you for a meme in my blog, feel free to ignore me! Thank you, Carol, for your kind comment. I've left you a message, and send all good wishes to you and your beautiful little daughter. Every man should have a shed! HerHimnBryn mentions her "Grandad's shed". He was my father and she sums up those evocative smells about right. All those little boxes of screws and nails, all labelled, now repose in my garage (too useful to house a car - it is my "shed"). 20 years after his death I am still using all this stuff and a lot of it will never be used by me, but still I keep it. When I pick up a tool of his, stamped with his name, I feel he is looking over my shoulder whilst I use it.